BALTIMORE, MD – This presentation on the Public Philosophy Journal, invited by the APA Committee on Public Philosophy, provides an update on the status of the development of the open access, open peer review journal. 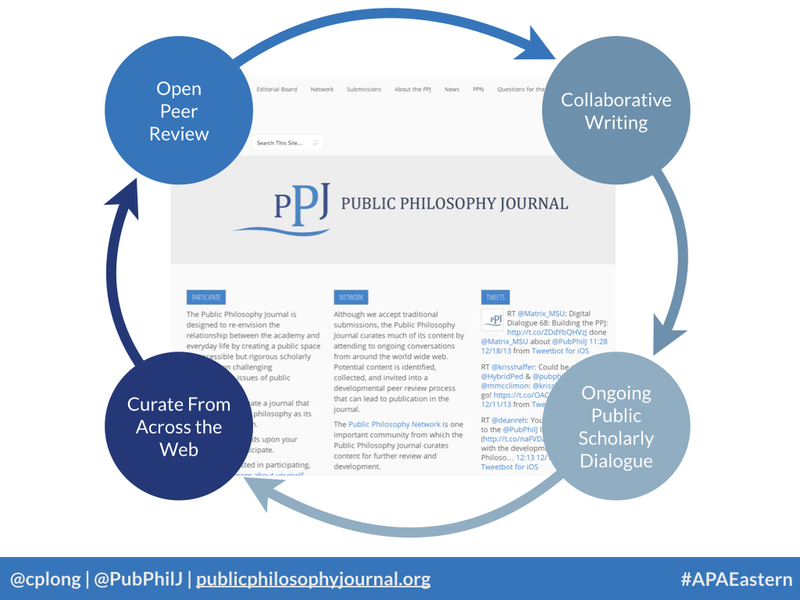 However difficult it is to create an open access, open peer review site of excellent digital scholarship, the Public Philosophy Journal includes a yet more ambitious performative dimension: the PPJ seeks to perform, as its very mode of scholarly publication, the sort of public philosophy it hopes to cultivate and amplify. In order to do this, the PPJ will need to think as much about how it publishes as it does about what it publishes. The two cannot be separated. Cultivating a culture of excellent scholarship in an ecosystem of digital curation, review, revision and publishing is as important as, and ultimately determinative of, the artifacts of scholarship the journal publishes. By leveraging the open and collaborative capacities endemic to digital scholarly communication, the Public Philosophy Journal aims to cultivate a community of scholars engaged in curating, reviewing, editing, co-writing and modeling rigorous work related to public philosophy broadly construed. PPJ Circle Slide from the 2013 APA Eastern Presentation. The PPJ is, of course, a work in progress, and here the presentation draws upon the material Mark Fisher and I developed for this video about the Public Philosophy Journal. The central new content here are more fully fleshed out conceptions of the Disciplinary Economy of Open Peer Review, the Peer Review Coordinator and the Collegiality Index, issues about which I’ve written about on this blog. In addition, I have drawn on Mark’s excellent distinction between crowd-sourcing and community-sourcing. In the end, however, the success of the PPJ will depend upon the community that can be cultivated around it. The hope is that by exposing the ideas of the journal to a wider audience, we can receive feedback from the emerging community about the developing ecosystem of scholarly communication we are trying to create. We invite such feedback below or on the Public Philosophy Journal website itself.